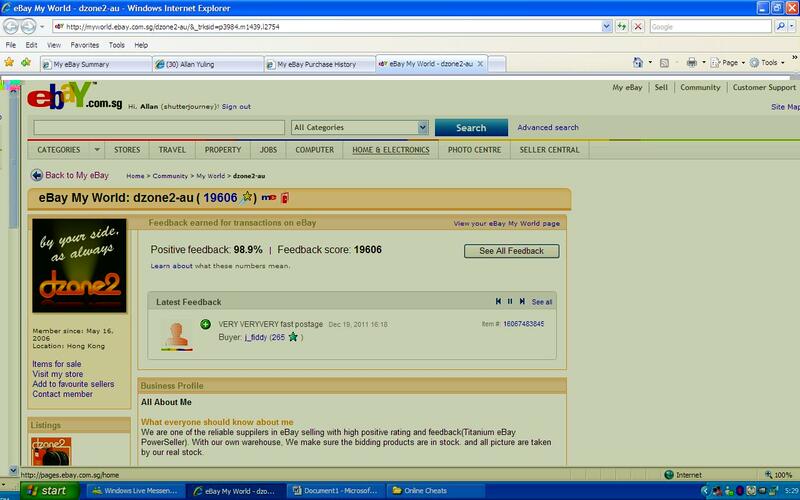 ← eBay Beware – Online Cheat “jhlny2002”. I have created a new Category on this site for online cheats, so do check back often for updates and be protected. Especially Sellers from eBay. A fellow photographer “Ray” (name changed to protect the identity of the photographer), approached me to help him buy a Sony DSLR Lens off eBay. He sent me a link to the item and I found the eBay shop familiar. Then I remembered that I had bought things from this eBay shop before with no bad experience. So I went ahead and collected the money from Ray and made the purchase. Then things started going wrong. First, I find it weird that the lens was not shipped after 4 days, so I wrote to the seller. The seller replied me and told me that they have not received my payment. In panic, I log in to my PayPal account and check – I had Paid! So I called PayPal to verify, they confirmed my payment had reached the seller. OK, so I called “dzone2-au” in Hong Kong and told them about my conversation with PayPal, but they insisted that they have not received my payment and will not ship the lens. I insisted that they check with the Hong Kong eBay/PayPal office why this is so and they did. After 2 days, they finally told me payment cleared. Fine, so I presumed everything is in order again. Then I found replies in my eBay message box from Dzone2-au saying there was no stock. Seriously? I called and make my stand again and they found a lens and promised to ship out ASAP. And they did. But. When the lens arrived, I brought the parcel to Ray’s house and let him open by himself. On closer inspection, Ray found scratches on the outer filter ring that looks like the lens had been dragged over a rough surface and there were scratches on the lens cap and on the barrel too. This came as a shock to both of us. Dzone2-au is supposed to be a reputable eBay shop and a good seller, but receiving this new Sony lens in this state is really unbelievable. So I wrote to them with Ray in the copy. Then the person who helped me sort out the payment mess told us that the shipping and packing was handled by another of his colleague and referred us to him. Patiently, we wrote to this person, and took photos of the defects on the new lens and they stopped replying after we had sent them the photos. Even if they offer a refund and ship the defective lens back (at our costs), we had incur losses on time, trunk calls and return shipping. In the first place, why don’t they even check the condition of the item before packing and shipping? I round it up as this eBay shop is simply just irresponsible. Will you buy from this eBay seller? Yes, their price is cheap by any standards – but, do remember that if they send you a cosmetically defective lens to you (like in our case), are you willing to pay the return shipping? This entry was posted in Blacklisted Online Shops/ eBay Sellers and tagged Banned Seller, eBay Cheats, Online Cheats. Bookmark the permalink. 3 Responses to eBay Beware – Online Cheat “dzone2-au”. I’m very sorry for this trouble caused. Please trust me, I did have checked it before I shipped it out, I really don’t know why you can’t use it well. If possible, could you please send me a video for this problem? I will send it to my QC to have a check, ok? After 38 days from purchase the seller stopped responding to my emails. He knew that he could succeed in cheating me  At that time I was not aware of 45 day limit, so after about 50 days I had no choice but contact Ebay for help. I was pushed from one Ebay customer service staff to another and was even asked to go to Ebay resolution center. Of course the resolution center also works on 45 day limit. Paypal also does it. So from above I will never allow seller more than 30 days to solve issues ….. delivery, defects, etc. After that I will put on negative feedback, report to Ebay and get refund from Paypal. It would be good to start a thread in Facebook or ClubSnap on such matters and poor customer service ……. Strange. “hkyongnuophotoequipment” is also a vey reputable seller & eBay shop, am surprised they pull off such a stunt too. Hiaz. Buying online is really luck.